Container gardening is a great way to grow various types of plants at home is a regular garden is not an option. Containers can also be used to grow certain types of crops you do not want in a garden or when the soil is inadequate. 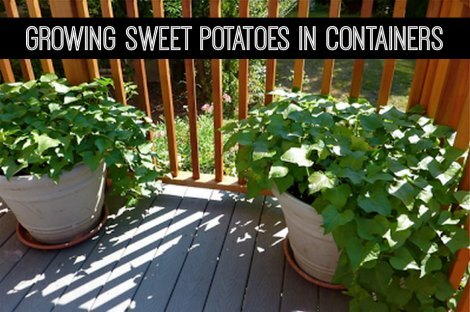 One idea to consider is growing sweet potatoes in containers. Growing sweet potatoes in containers is a better option than planting them in a garden as pests typically are not an issue. There are also a lot of other benefits to consider such as retaining heat and drainage of water. The most important thing is to have the best growing conditions. The key to growing sweet potatoes in containers is using potato cuttings that can be grown inside. This will give you a good head start before moving the container outdoors. You can start this process at the end of March or a before the last frost occurs.